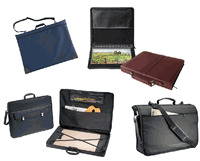 Portfolio cases have a variety of uses for the professional architect and draftsman. These handy carrying cases can be used to transport specimens of the artist's work from place to place in a safe, efficient manner. Most presentation cases are specially designed to be able to protect and preserve the artist's work from the elements, as well as damage due to dropping or rough handling. The ultimate goal of every artist is to present samples of their work to the potential client for their edification. The artist therefore needs to have full confidence in their choice of portfolio or presentation case. Using a top quality portfolio or presentation case is the best way to ensure that this ultimate goal is realized in a safe and timely fashion. These excellent, top quality portfolio and presentation cases have been designed to fit nearly every possible application and circumstance. The range of cases are available in several styles of construction, such as soft or hard sided design. They are designed to be lightweight and easily portable. Most cases are constructed of tough, extremely durable leather or nylon materials. Some even come with a guaranteed warranty of quality. No matter whether your needs include portfolio or presentation cases for your next meeting with a client, there is a vast stock of goods is sure to meet and exceed your personal and professional expectations.